The history of street art in New York City is haunted by specters of social injustice. The South Bronx, struggling with mass drug addictions and racialized poverty, served as an epicenter for graffiti in public areas and on subways in the 1970s. Keith Haring’s eccentric figures underscored the AIDS epidemic after his death from the disease in 1990. For decades, street art has been a symbol of rebellion amongst the most oppressed communities; taking to the streets when the rest of society has forsaken them. Yet within the last two decades, the politically charged graffiti of the past has by and large been replaced with large, colorful murals, meticulously painted on the sides of buildings, commissioned by urban developers in order to gentrify neighborhoods. Urban theorist Richard Florida hypothesizes that city authorities must distinguish their sites both visually and recreationally to entice the “creative class” to move into lower-income areas. The target demographic, the “bohemians” or the “hipsters,” consists of upper-class, college-educated, white adults, who form the basis of a post-industrial working-class. Consequently, developers commission artists to create murals on the sides of buildings in order to reel in the creative class. The use of murals as a tool of gentrification is both clever and deceptive: as an inherently transgressive art form, the presence of street art can create the illusion of insurgence and rebellion, while being created only at the mercy of developers and city planners. It constructs itself as hip and bohemian, yet it has severed itself from its radical roots by imposing on communities that already exist, each with their own historical and cultural significance. When analyzing this issue, an important distinction to consider is what separates “graffiti” from a “mural.” It is easy to conflate the two; however, according to a Columbia University School of Journalism study on street art by Seres Lu, there are significant differences between these two forms of street art. Graffiti predates murals; it first emerged in inner-city communities as a form of expression by the local youth, and its illegality solidifies its counter-cultural grit. In New York, graffiti tags first began appearing on subway cars. . On the other hand, a mural is typically painted by a formally trained artist and is image-based. While muralists often take cues from their predecessors and deliver overarching social messages to the public, the difference is that murals are usually commissioned or painted with permission. Furthermore, the associations made with different types of street art is largely informed by beliefs about the communities in which they originate. Graffiti has been long been identified as a symbol of low-income areas heavily populated with racial minorities. Its presence is assumed to be synonymous with juvenile delinquency, poverty, and lack of government oversight. Conversely, murals tend to indicate that a neighborhood is experiencing a rebirth or an increase in wealth, thereby marking it as a “safe” yet artistically rich area. Indeed, the presence of a particular style of street art in a neighborhood can do more than indicate what sort of area it is: many artists who have built careers off of graffiti struggle to be recognized in the face of gentrification. The demolition of 5 Pointz, a former factory turned outdoor mural space in Long Island City where street artists could freely paint, is the most notable example of how street artists in New York City are quickly becoming displaced. In 2013, the building’s owner, Jerry Wolkoff, controversially decided to develop the site to build condominiums. Though mass protest ensued to save the building, including a statement made by Banksy at the end of his infamous New York City residency (“Thanks for your patience. It's been fun. Save 5pointz. Bye.”), hundreds of street artists soon found themselves without anywhere to legally paint. Many of them found work for property owners looking to beautify their buildings, but only under the condition that they would paint aesthetically pleasing murals instead of their trademark graffiti. The preference for murals over graffiti is understandable; its aesthetically pleasing imagery bodes well for businesses and community organizations. Many city-wide initiatives have emerged in the last decade to combat graffiti appearing around the city. Organizations such as the Little Italy Street Art (LISA) Project, the 100 Gates Project, and the East Harlem Preservation Group have all received grants from the city to commission artists to eliminate graffiti in their respective neighborhoods. However, it is quite clear that murals are being treated as the solution to graffiti. In doing so, they are not only helping to gentrify neighborhoods, but murals themselves are a gentrified form of graffiti. The rapid development of Bushwick, Brooklyn has been demonstrative of graffiti artist’s struggle to gain recognition in the face of gentrification. coincided with a booming street art community. Once a low-income, working-class neighborhood, Bushwick has followed a pattern of gentrification seen in other parts of Brooklyn such as Williamsburg and Greenpoint: young, single, predominantly white artists moved to the area in search of affordable housing, bringing new capital into the territory. Bushwick now boasts hundreds of murals painted along the side of buildings, warehouses, and commercial storefronts. The Bushwick Collective provides a platform for both emerging and revered artists from around the world to adorn the streets of the neighborhood with murals. The Bushwick Collective was founded by Bushwick local Joseph Ficalora in 2012, who sought to commission a street artist to paint a mural of his late mother. Eventually, he started inviting artists from around the world to paint walls all around the neighborhood. Much to the dismay of local graffiti bombers, they were initially not invited to participate. The collaboration between Zexor and the Bushwick Collective could indicate a more promising and amicable future between graffiti artists and muralists in New York City. The two varieties of street art can certainly coexist with one another, so long as one does not hold dominion over the other. Murals need not be treated as the antidote to graffiti as if it is a threat; conversely, graffiti does not need to encroach on other’s work if there is room for everyone. Gentrification is an unstoppable force in today’s world; there is little to be done about it. Indeed, it is crucial to remember that the origins of street art exist in rebellion, and it has historically been a form of visual representation for marginalized communities. Street artists today should pay tribute to that fact. 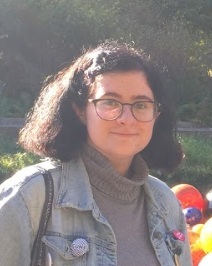 Claire del Sorbo is a senior at Fordham University’s undergraduate college, studying digital technology and emerging media and women’s studies. She has studied the political messages of street graffiti in the Bronx in collaboration with the Bronx River Art Collective, and has also participated in a dialogue titled “The Graffiti of Gentrification” with BRAC. Her area of academic study focuses on social media as a tool of constructing dialogues among members of society who are frequently pushed to the margins.